Simply amazing. By far the best one made yet. I thought the visuals, the script, the actors, everything was brilliant. It is such a long book to turn into a movie so I understand why they had to move through the story so fast. But I think they did an amazing job. Fred & George were hilarious, as they should be! Daniel R. I think has improved loads since PoA. My biggest dislike would have to be Barty Crouch Jr. in the Riddle house. And Hermione's dress color. But that is pety. All in all it was GENIUS. Standing ovation for sure. I love Goblet Of Fire! By far the best one made yet. I was a bit affraid that Kloves would mess this one up, especially because of the size of the book, but I have to say he did a very good job! Mike Newell - well done!!! So I have only a few comments besides saying: Well done, indeed! The music - I admit that I miss John Williams! To me it was not the same without him! I really hope and pray that he will be back for OotP! Hermione - To me she sounded like she was near tears through the whole movie! However, my heart broke when Ron and her have a fight at the Yule Ball - I just wanted to hug her there (well done Emma Watson!)... Tsk tsk Ron! There are of course things which they have cut out or did in another way but all in all this is the best of the HP movies so far!!! Although I can't help but think if I love this movie so much because I have read the book (and therefore knows what things there perhaps should have been explained for example we do not get to know about the Marauders), or do I simply love it because my expectations were not that high given the fact that the book was so huge? Oooorrrr perhaps it was because I was sitting in a cinema were everyone loved the HP universe and had been looking forward to seeing this movie, and were cheering and clapping? No matter I'm so happy I went to see the movie at 11.59 on the 17th Nov. because there were people dressed up, and there were people from a Danish HP site who walked around dressed up and handed out posters. And the cinema had a Goblet Of Fire (just like the one in the movie) put up so one could walk around it and everything--it was very cool! It could have been fun if they had let us drop our names in it! Just one last thing: Is it just me or does Kloves have something against endings? ...Especially the one in PoA and now GoF? Last edited by *Snivellus*; 11-18-2005 at 10:59 AM. Definitely the best one yet! I still haven't recovered from watching it, I was so excited! I need to watch it again to really take it all in, and to fully understand it all. There were several amazing scenes, that just took my breath away, like the first task, the quidditch world cup and Voldemort's return, WOW!! Daniel has improved in so many ways as an actor, he was absolutely outstanding in this one! I really felt his pain during the scene where he brings back Cedric's body.. I admit, I cried like a baby! I don't miss him at all! I think Patrick Doyle did an amazing job, the music fit perfectly with the scenes and I can't wait to get my hands on the soundtrack! He's more than welcome back for OotP! But, like you all mentioned, the movie wasn't perfect. At times it did feel rushed, and I felt like there were several key scenes missing. Like the whole Prior Incantatem thing, there was absolutely no explanation. I had to explain it all to my friend (who hasn't read the book of course). She didn't catch the whole Neville thing either, about his parents. I guess you must have read the book to catch that mentioning of them in the pensive. Also the whole Dumbledore vs the Minstry thing was barely mentioned, how are they gonna get it all in the fifth?? Anyway, it was a truly amazing movie, and I'm definitely gonna watch it in the cinema a couple of more times! Great job Mike Newell and everyone else involved! Last edited by swedishharrypotterfan; 11-18-2005 at 01:36 PM. The only downside of it, it's was a little too rushed. The tasks were incredible!! The maze was very scary and I loved it! The grave yard scene, definetely my favorite!! Ralph rocks as Voldemort!! he was exactly as I imagined it. It was scary was it should be, and Proir Icantatem was awsome! Yeah, I would've liked some explination, but I imagine that putting a book that big into a 2 hour and 30 minutes movie, they had to take that and more away. i loved the movie, i loved how the actors have matured and how there's a whole dark and scary feel to it. the quidditch world cup was dissapointing,for me. the first task was interesting..the whole deviating from the original way was fine. the second task was fantastic! i loved it! however, i am dissapointed with the 3rd task..wish there was more to it. the ron/hermione thing didnt come out much,but still,it was fine. the ron/harry animosity was great! im dissapointed hagrid's story didnt make it. and i absolutely love the portrayal of voldemort! fiennes did an amazing job on him! i shrieked at the first view of voldy, and the whole time afterwards he had me spooked. i don't much like dumbledore in this movie, i think the whole "man-handling" of harry was extremely out of character. barty crouch jr was great, karkaroff was good too. moody was disturbing. and i hate to say this, but they should stop making harry cry in the movies. dan just hasnt got the crying thing down (in my opinion). I give a rating of 9.5 out of 10! Yesterday was the second time I watched the film and seriously, this has got to be the film I couldn't get enough of! I take my hat off to Mike Newell for doing a brilliant job in the director's chair. Adapting a book that is the size of a house brick into a 150 minute movie is no easy feat. About the script... Thank God! Ron has more important lines in this one. One can definitely see now that both Ron and Hermione are Harry's two best friends but Hermione still overshadows Ron a bit, in my opinion. Daniel, Rupert and Emma were fantastic in their respective roles. Although I think Dan sounded a bit funny when he was crying over Cedric's body. During the Yule Ball scene, to me.. Ron didn't look too jealous of Krum. He did, don't get me wrong but the green-eyed monster wasn't too obvious. Emma was fabulous in the scene after the ball where she was especially mad at Ron. It was fantastic. Malfoy didn't really play a big role in this one and we didn't get to see much of him. Tom looks extremely good in black!! Heheheheh... But I absolutely adored the ferret scene. The Twins' were especially funny and I loved every bit of them in this one. Brendan Gleeson was perfect as Prof. Moody and I'm glad we get to see a bit more of Prof. McGonagall in this one. In GoF, her role as vice-headmistress and Head of Gryffindor is more obvious than the other three movies. Alan Rickman was just too cute in this one, especially in the study hall where Ron tries to ask Hermione to the Yule Ball but finds out that she already has a date. Rita Skeeter, played by Miranda Richardson, was excellent. She did a great job as a nosy reporter although I wished she was exposed more in the film. Shirley Henderson was great in reprising her role as Moaning Myrtle. I love the way she teases Harry in the bathtub scene and how she made obvious her liking for Harry. Ralph Fiennes made an excellent Voldemort. I liked the way he teased Harry about duelling. He was almost unrecognisable but who could forget those eyes. Anyway, he played the role convincingly and I can't wait to see more of him in the future films. Robert Pattinson was perfect for the role of Cedric Diggory, the other Hogwarts' champion, and so was Clemence Poesy as Fleur Delacour, the Beauxbatons' champion. But I sort of pitied Fleur's role as she was always seen as the weakest champion but nevertheless, she played her role uite convincingly. 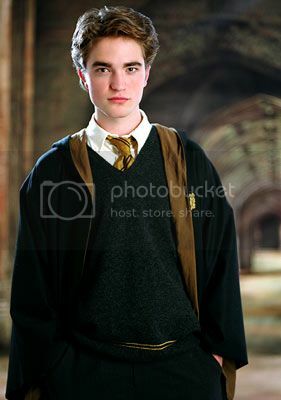 Robert was divine as Cedric, displaying confidence and charisma while still being the humble boy he is. Stanislav Ianeveski was a good choice for Viktor Krum. He did seem like someone who, to quote Prof. Moody in the film, who's head was filled with sawdust. Quite convincing, I must say. Katie... Ah Katie... I expected too much for Katie but I don't really blame myself not to. Cho Chang's character has been publicised as Harry's first crush. Well, now it seems like her character's too overrated. She only appears a bit in the film and did not make a big impact on screen. If it wasn't for her role that was so well publicised, Katie would have been easily forgotten. I thought she'd do better after having much pressure from the fans to do well but I guess not. I must say, I absolutely love the music in this one. It seems like the music gets better and better with every film. I especially love The Weird Sisters. Kudos to the rockers who made The Weird Sisters seem like a real rock and roll band. I am amazed with how the movie was set. It was all dark and gloomy most of the time, making it obvious that this film isn't going to be so 'magic is so fun and cool' anymore. However, the movie was too rushed. I still say that Mike Newell did a great job adapting the book but I can't help but feel that there are some scenes that were left unexplained. Like the Neville scene inside the DADA class and the Priori Incantatem scene was a bit too blur, really. Someone who hasn't read the books wouldn't really know what a Priori Incantatem is. I felt that the Quidditch World Cup scene was a rushed too. But nevertheless, it was an excellent introduction of Viktor Krum. The creatures of the deep were seriously creepy and the graveyard scene was mad. The Death Eaters, Voldemort rising again.. it was just so scary. I can't believed it's still rated U (meaning everyone, even kids, can watch it freely) in my country. Trust Malaysia's crappy censorship board to rate a movie properly... Sigh. I mean, c'mon! It was brutal!! The way Wormtail just cut his hand like a piece of meat... Geeez!! Anyway... The Yule Ball scene, I thought, was stretched a bit too long. It was nice to see the Great Hall looking different and the dance they did was cute. I think that the tasks were set to easy. It seems like it gets easier by the task, meaning the First task.. the dragon, was the most difficult to get through. The second was a bit too easy and the third well.... Although it may seem scary at first but magical creatures would've been better than hedges attacking you and swallowing you whole. Besides, Harry got to the cup too easily. I think that GoF is the best film yet. Although I didn't really like the missing presence of SPEW which would've caused a big disagreement between Ron and Hermione. I also didn't like Hermione's dress, although it did look good on Emma, and the fact the Patil twins' were in the same house. But hey, what are you gonna do? The movie turned out great anyway so cheers to everyone who's worked on producing such a wonderful film. I'm definitely going to watch this one in the cinemas again and again. I loved the dream and David Tennant! *dies quietly*. Hermione was a bit of a pain waking harry up! the world cup left me wanting more! the arrival of the champions great! Harry going into the room and Dumbledore shaking him was a bit OOC but still all good! i really liked the film. Rupert Grint was defenatly the best of the trio and after the fight with harry the word he says that is not his usual sware was sooo good! Micheal Gambon growed on me totaly! THe scene with Harry and Mertil was very funny and she stepped up her persuit of harry from beyond the grave! THe tasks were great! the ball was ace! if not a bit short! I missed Snape showing his mark when Barty jnr says " i'll show u mine if you show me yours" i really expected Snape to show his but it was for a cut on harry! boring! Not enough Snape! the scens with Snape are great i mean Rickman is the bestest adult actor! but he isnt used well at all and we miss things that will be needed for OOTP! that said Mad-eye was great and so was Voldemort although i didnt find the end very scary! i loved Lucius malfoys face though he looked like he was realy enjoying harry in pain! Gambon is growing on me as Albus he is very tactile with harry in this film. I defenatly agree with Emma Watson overacting she really did but i wont take away form the fact that she is very beautiful at times in this film! Need to see it again! I will give it a 9 out of 10. The special effects are awesome, mind blowing in parts. The music is fine too. I think the acting greatly improved over the last one. This is by far, the best HP movie to date. However, if you are a huge fan of the book, you WILL be disappointed, simply based on the fact,of the large amount of content the movie left out. I walked away wanting more, and saying "how could they do that". The movie ws very rushed, and moved way too quickly from scene to scene. It did not do a very good job of explaining anything so that the moviegoer who has not read the book ..will be totally lost on key elements. The editing in my opinion was very choppy. Oh yeah, I knew I had forgotten to mention..the Quidditch World Cup was very disappointing...I would have so loved to see more of it. The Dark Mark scene was horribly disappointing to me, it left so much out, and for being such an important factor in the series of books..it was a bit of a let down. The Death Eaters marching reminded me too much of other racial haters in the world, and it was repulsive to me. Also, I totally think the one scene that was needed to kind of wrap up the movie towards the end, was the scene in the hospital wing....where everyone gathered to hear about Harry's ordeal and the coming of the Dark Lord...Also when DD tells Lupin and Snape what to do next..is an important lead into OotP...and I really think they should have referred to it, so basically, we get to "see" Snape set off on the task DD assigns him...Way too much was left out....And yes, I know it was a long book..but make the movie another 20 minutes longer....I doubt anyone would have minded. o well probably 9 out of 10 it was really good! yes the world cup was kinda disapointing they barley show it that much! Nevile was so funny this was a great movie the part at the yule ball um..was pretty good but they made it look waaay 2 teen-ish in a way i mean if i saw all dancing to the band i would never think this was a hp movie.Wanna hear something i odered tickets before hand in i-max and at the part of the of the thing with snape saying harry stole stuff from hois garden the screen went dark and conk out cuz the i-max got screwed every one was like'nooooo' then the i-max people were all like 'srry bout that' then it came back and contiued after 5 mins! thankgod! but it was such a good movie and i enjoyed it so much the dark mark was way 2 quick but mike newell did a amazing job!!!!! 9/10 ! i loved every single part! but then i was a bit disappointed that the QWD was kinda short they barely showed much. =/ the acting has very much improved. Especially Harry Potter's acting! LOVELY. Voldemort was scary... he looked like one of those scary dudes from the LOTR movie (first or second. the ones with no noses! lmao)... The Weasly Twins were HILARIOUS and its good they got more exposure. The funny part was when they tried putting their names in the Goblet! lol and when they were in the class where Prof (whats-her-name-Transfiguration-teacher *sorry had a total mental block!!) and they were teasing Ron! Hmm.. what else... The Yule Ball! wonderful! Hermione and Krum looked so CUTE together there! And Ron being all jealous was awesome too... I love the part where they fought and then Hermione ended up crying. That was REALLY good.. Sorry if my review was a bit sucky but Im going to have to watch the movie AGAIN. haha! Oh and must I say, Harry and the bathroom scene? OH GOD. he was SHIRTLESS and I had a post-hypnotic-trance for a moment when I was watching that. Moaning Myrtle was kinda creepy... she seemed so horny. lol and Harry was freaked out! haha! I loved the movie. I do agree it went by too fast. I would have loved to see more of the world cup. I mean the stadium looked amazing and the introduction of krum was awsome. The could have just made the movie a straight 3 hours to add missing things. Like Snape showing his dark mark. I wanted to see it when he barty said I'll show you mine if you show me yours. Also anyone who didn't read the book will get confused about Prior Incantatem. It just happens fast and there is no explanation. I was stunned when Cedric died. I knew it was going to happen right when they got there and it happened so fast. Dumbledore says he was murded by Voldemort but Pettigrew actually did it, he just told him to do it. He died so fast and I started to tear up a little. They came on seen then suddenly bright light and you hear Harry scream and hes gone. Its sad when Harry and Cedric get back. Harry is crying over Cedrics body and everyone starts cheering. Then Fleur screams then everyone else starts to realize Cedric is dead. I missed the Dursleys at the end. Waiting to pick Harry up. Mrs. Weasley hugging him, hermione kissing him on the cheek for the first time. lol That would have been an interesting scene with Ron. Also no snogging of Hermione and Viktor. I laughed so hard in this movie. The Twins were absolutely amazing. When everyone is learning to dance. Try saying that 5 times fast. Then they say it to each other back in forth whispered. I don't remember what it was but there were a lot of B's. lol I went Thursday night 12:01 showing. I didn't make it to school the next day. I wish I did go so I could talk about the film with friends. My mom said I was grounded because I said I would be up in time. I want to see it again, but my friend is going with her dad this weekend and her mom said she was grounded for being late to school. So I'll try and go with her. I want to see it again tonight though. Its hard to remember it all. It went by so fast its hard to remember all that happend. filch running into the hall was so funny. He was like half hopping. When Beauxbatons and Durmstrangs entered it was amazing. The Beauxbatons were all graceful, then it goes to durmstrang and there all loud. Viktor comes in last walking up with Karkaroff. All the actors were amazing in this film. Everyone improved greatly from the first film. Lilly also spoke to Harry telling him to let go in this film which was great. SPEW would have made another argument between Hermione and ron. After the ball when Hermione says you ruined everything to Ron was just brilliant. She yelled at Him and Harry to go to bed. At the end when The 2 schools leave is cute when Viktor comes to Hermione. It sounded like he said her name right and he gave her a note and said to write to him. Then he blows a kiss and walks away. Also it didn't show Rita skeeter as a beetle. Where Hermione catches her. It doesn't show Viktor talking very much, Hermione and Viktor do talk by the lake where he pulls the beetle out of here hair. I also missed all the creatures in the third task. i was waiting for it. Then it showed Cedric and Harry and the cup. It happend to fast. It was too easy to get to the cup. The dragon chase around the castle was brillint too. It looked like the dragon had actually got Harry when he bites at him. You would think Hermione would freak even just at first when she saw Viktor as they came up. His head was a shark. Viktor also like snapped at Harry when they were near Ron Hermione, Cho, and Fluers sister. Its hard to remember it all but snape hitting them in study hall was hilarious. I was laughing so hard. there was also a bit of drama into it. When Ron asks Hermione to the ball as a last resort. Then she says she has a date. then at the ball he thinks she is lying and is in her room crying. Then at the end of the Yule ball she says maybe next time you should ask me before someone else does and not as a last resort to ron. Hermione is crying or almost crying in this movie a lot. I would have like to see her and Viktor together more. Well if I remember anything else I would like to add I'll post agian I guess. Just me rambling off, have to talk abut it. So much to comprehend. Need to see it again. I only saw lilly when they came out of voldemorts wand and not James. I was more focused on her. when I watch it again I'll probably see a bunch of things I missed before since it went so fasr. Can't wait for the DVD to come out so I can watch it over and over again and not have to pay every time. i know like all the words to the third movie because I watched it way to much wanting more Harry Potter. I want to know every little thing that happens in the fourth book. Well I'll be off now but GOF is the best movie yet. The sixth book is the best and I bet I'll think the 7th is after it comes out. The books and movies just keep getting better. More and more action. This one just had a lot of action because of the Triwizard Tournament. Well Goodbye! It was fast paced but told very well. They for sure got that Harry and Ron fighting thing down. And the Yule Ball....awww...so much can be said about this! A lot of the stuff Ron and Hermione said was new and not in the book but I liked it because it all the lines were true to the characters. I thought the movie carried a lot of emtion that was left out of the other films. I REALLY felt sorry for Hermione after the Yule Ball when she's crying on the staircase and it taking off her high heels. Personally, I thought Emma was more in character in this film than in the 3rd. She was using big words and being more of a smartypants. Though I could go without the pink dress, Emma did well! Still, I think Rupert was the best of the trio in this movie! It sounded like he was about to ask Hermy to the ball...though he was trying to do it lightly...and him saying to Hermy that Krum was using her...wow! He's really jealous. Aw.....I feel bad for Hermy again...she needs a hug. Oh.I loved how Hermione got all shy and stuff whever Victor was around! lol! Like when Krum's about to swim..she clearing her throat and pretending to be reading her book! Though I'm a huge R/Hr shipper, I thought Krum and Hermione were very cute together! I just love the fact we get to see a "new" Hermione. I've never seen her that way but I like it. And the part where Krum blew her a kiss! lol Priceless! I thought Dan's crying was better in this movie. I loved the music. The lighting I LOVED in this film! I love the contrast between the sunlight and darkness. Th ending....they did it justice! All in all, this film was action packed and had a lot more emotion and I'm for sure gonna see it again! Like others have said, it felt rushed and too much was cut out for my liking, but something had to give I guess. I would've loved to have seen more of the Quidditch World Cup, and don't get me started on the 3rd task. The music was outstanding, more adult and fitted in perfectly with the dark change in storyline. Hermione grated me in this one. I just felt like Emma overdone it just a touch. Having said that she does have some lovely scenes, like the Yule Ball. I've fallen in love with the Twins! They had me, and everyone else, in fits of laughter, I'm glad they've gotton more exposure. Oh, and I just knew Ralph would make a fantastic Voldemort! All in all, a great movie, but it was frustrating in a few places. Last edited by Vanilla Sky; 11-19-2005 at 04:14 PM. 10 out of 10, excellent film. The visuals and humour were the best yet. This film had a lot to live up to for me as it is my fave book. Mike Newell proved himself worthy of taking over the helm pity he's not doing the next. The only part that did dissapoint me was the Quidditch World Cup won't say why incase some haven't seen it yet. Ralph F was perfect for the part of Voldemort. Even though I am 29 and know the books inside out the graveyard scene still gave me the frights!!! Going next week to see it again!! Deffinetly a very well made film. It was wonderful. Although I do wish the had add more of Hermione, but that is might be because she is my favortie character. I also wish they had added more shots of them actually learning instead of fighting all the time. I think the Yull Ball was great. Rupurt played his part of being jealous very well. The QWC was extrodinary! I think I'm going to have nightmares from Voldemort. That was awesome ,the whole graveyard scene. I cried when Cedric died and Dumbuldore did his "Remember Cedric Diggory" speech. I was so sad! But all in all, it was a great film. I will definetly go and see it again! absolutely PERFECT!!!! SEEING IT AGAIN TONIGHT!!!!!! I'm just sad now cuz this movie is what I have been looking foward to all this time and now I've seen it. I would like to see more--have it continue and be like 7 hours long. I think I just need to see it about 8 more times and then I'll somehow be happy/satisfied. 20 out of 10. wonderful splendid I can't wait to see how much it's gonna make at the box office!!!!! wooohooOO!!!!!!!! Every seat in the theater I was in was filled---the whole day-all of the showings were sold out. I only saw about 5 kids and they were crying when it was over. I thought Voldemort looked kinda like an alien of some sort----EVERYTHING was perfect! MUST SEE IT AGAIN!!! I AM SO ESTATIC!!! I give it a 9/10. I thought it was a great movie! The best one yet by far. I think they could've included some more info from the book, but I understand the time constraints and all. Also, I do agree with someone above who posted about missing John Wiliams. Yes he had a prior committment to Star Wars 3, then I would've chosen James.... crap I just had his name and I can't remember it. He sounds similiar to JW. Horner. I think that's it. lol, anyways, I loved the movie. I thought the actors did great! I haven't read this book for a while, and it was nice remembering moments of the books. My fiance is taking me to see it again tonite! If you haven't seen the movie yet, obviously don't click on the link lol. Last edited by all4oliverwood; 11-19-2005 at 07:00 PM. It was GREAT!!!!!!!!!!!!!!!! Totally worth wait! Best was definetly the Ron and Hermione argument at the Yule Ball "WELL NEXT TIME YOU SHOULD HAVE THE GUTS TO ASK ME FIRST BEFORE ANYONE ELSE DOES!" In the book, Harry totally realizes that Ron likes her... Anyway the movie was so good! I can't wait for the fifth one! Do we really need to ship anylonger? Last edited by HarryPotterlovr101; 11-19-2005 at 07:14 PM. Gone are the sunny days of Hogwarts. The trio are teenagers and their moods are as volatile as the dark weather that surrounds them. I’ve just gotten back from seeing Harry Potter and the Goblet of Fire. I’d have to say it’s one of the best ones yet. The magic is there but with a new twist. The typical teenager behavior that Harry and co. exhibits is absolutely hilarious. The darker elements of the film such as Lord Voldemort were great and showed just how much the characters as well as the movies are changing and maturing. First my complaints about the film (note however that there are view). I felt as if the film was edited “choppily” so to speak. Prisoner of Azkaban had a sort of flow that seemed to be missing in this one. Particularly in the first 30 minutes of the film. While continuous action is good sometimes you have to sort of step back and let certain situations unfold. I didn’t mind that things were missing simply because nothing that was left out really threw me off. Though if I hadn’t read the book there may have been things that confused me at first. One of my favorite aspects of this film was the teenaged angst. The trio aren’t little kids running around with wands and looking wide-eyed and precocious anymore. There teenagers with hormones and all. I loved the moments when you just got a good feeling for the teenagers they really are. Case in point: The Yule Ball. I noticed in a lot of reviews that I read prior to going to see this movie that some moments in the film were reminiscent of a John Hughes’ film and I’d have to agree. The quintessential moments that all teens can relate too are portrayed so well and convincingly in this film. The moment in which Hermione breaks down and cries on the staircase was perfect. There were scenes in the film, that if you got rid of the magic and wand-waving, would bring to mind an episode of the teen-drama Degrassi. I absolutely loved how real these characters actually seemed. Harry, Ron, and Hermione all seemed more relatable. This could be for many reasons. One of them being the actors. I think that their skills have improved greatly. Rupert Grint truly embodies Ron and I also was happy to see that he was given more lines (other than quick witted one-liners) and it was obvious that he as well as Hermione were Harry’s best friend. Emma Watson showed a lot of emotion. Some times it was close to over the top but sometimes as a teenager your emotions are over the top. The crying scene on the stairs after the Yule ball was great. And Finally Daniel Radcliffe was much better than even PoA. His acting was more believable and his crying more real. He seems to be getting better and better each time. I don’t think anyone particularly stole the show. They all are progressing and maturing as actors. Kudos to them all! The darkness in the film was great. Lord Voldemort’s transformation was good because he looked evil and scary but he didn’t look as if he relied on his appearance alone to frighten. Ralph played him wonderfully and I can’t wait to see him in future Voldemort scenes. I really felt that this movie was the most realistic, emotional, involved, and frightening film of them all. As the characters and actors grow more comfortable with themselves and being on screen these movies get better and better. "And as it fell down around me like crystals, shattering as it hit the ground, I wondered how anyone could hate this london rain." It was chopped up, rather than edited, and Ema Watson's over-acting got on my nerves real quick. Why did she have to make everything look as if she had a gun pointed atr her?! Did anyone notice Harry was wearing only frames, not glasses? Everything I really looked forward to was nothing but 5 seconds glances of nothing, and the third task was rubbish. What I like was the scenery,the music so evolved for the tone of the film, and the entire graveyard scene. The second task, the Yule Ball and the Pensive were really good, too. Yes I cried for Cedric! But PoA keeps the top spot for me. First and foremostly, I'm going to be brutal. Not with the film-makers, but with the fans. Anyone who goes in to see a HP movie for the first time WITHOUT first researching the cuts, is doing themselves a GREAT disservice. You need to know, before you go, what is there and what isn't. Otherwise, you'll spend the whole film gasping for all the wrong reasons. I have no sympathy with fans who go without knowing there's no Dursleys, no SPEW, very little QWC etc ... The internet exists, so use it. Harsh, I know, but all that has been common knowledge in the fandom for MONTHS and by not finding out about it, you're only disappointing yourself. And you've got no-one to blame but yourselves. Realistically, we all know there will be cuts. You can gripe about it until the sun comes home but that won't change a thing. Get over and get on with it. With that said and done, I loved 'Goblet of Fire'. The beginning -- I heart Patrick Doyle. I love how he creepified Hedwig's Theme. Dark from the word go, gets a thumbs up from me. Everything about that 'dream' sequence matched the images in my head with the added gorgeousness that is David Tennant as Barty. Evil is always good looking, in Harry Potter. Admittedly, the first few scenes were very quick and in an 'if-you-blink-you'll-miss-it' fashion BUT I like this style. It goes to show the film is RELIANT on audiences having read the book, ergo it is a film primarily MADE FOR THE FANS *cheers* No more patronising Columbus. Whoops, did I say that aloud? Hermione waking Harry & Ron up was great. Especially Ron. It's the little things that make GoF great. Like the 'knowing' look between Hermione and Ginny at the sight of Cedric. The portkey location was a bit overly dramatic, as was the whole sequence really, but the rest of the film made up for it, so I can let that slide. One thing that annoyed me was the way the camera ALWAYS panned to Ginny at certain intervals. It was like, yes, we get the idea, she's there but HELLO she doesn't do much in GoF! You get the idea they're setting her up for HBP, which is fair enough, but it's a bit of an overkill really. It goes from nothing to all, in one film. It could've been done in a far more subtle way, but again, I'm being picky. The campsite was really breath-taking. Not exactly true to canon, with the open use of magic, but again, I'm willing to let that slide. Harry's cheesey line isn't really all that bad. It's actually quite true. The stadium was brilliant and the appearance of Lucius and Draco was just enough to make sure the scene wasn't too happy. A lot of people have moaned about the lack of Quidditch. I welcome it. Jo said it's a pain to write and, from the sounds of things, it's not exactly the most comfortable thing to film either. Quidditch has never interested me and so I was glad we wouldn't have to sit through the match. No Quidditch = happy me. I don't care if that makes me unpopular If anything, I'd have preffered the whole thing to be cut. The teams arrivals and the cheering for Krum was totally anti-climatic. The post-match scenes. LOL. The interaction between the kids was really funny, as was Mr. Weasley, "No, it isn't the Irish." LMAO. This is one of the great things about GoF; the films ability to go from light to dark in the snap of a finger. Seconds later we see the camp being lit up and destroyed by the death eaters. We don't see them close-up, though their masks are recognisable. This is good, because it's not their appearance that's meant to frighten; it's what they are capable of a DOING that's meant to scare you. And, it does. Again, David Tennant does his stuff superbly and the Mark is very cool indeed. The disappearance of Barty and the arrival of the Ministry was all very well done. Mr. Weasley doesn't get enough credit, he is really good in these scenes. Next thing you know, we're on the train. I loved the whole set up. Firstly, Hermione actually has a book in her hands, outside of a classroom! I don't think we saw this AT ALL in PoA. But, thankfully, our beloved bookworm is back in GoF. Credit where credits due, Emma Watson is superb as Hermione. Some of her lines are overdone (DADA class, bridge scene) but mostly she's very good. You can actually see they've made her hair frizzier again in readiness for the ball later. Which is actually kind of funny from a fans perspective; it hasn't been this frizzy/bushy/untidy since PS! And the cute 'moment' with Cho. Her character really has been overpublicised for this film, I expect we'll see more of her in OotP. In GoF, she's little more than a cameo, however the scenes she does have, are brilliant (she's a very natural actress), and her Scottish accent is to die for. It's easy to see why Harry falls for her and the cute glazed look on his face, after seeing her, is just so adorable. Dan really nailed the "I've got it bad" look. So much so, that you just want to reach through the screen and hug him. The purist in me wanted to kick Harry for writing Sirius' name on the envelope (SNUFFLES) but meh, what can you do? Filch. He hobbles into the Great Hall, for some insane, inexplicable reason. But nevertheless, it was really laugh-out-loud funny. There are lots of moments like this in the film. Some people have said it's 'too funny'; I disagree. I think the light and dark parts are fairly well-balanced. Also I feel GoF was the funniest book and the comedic bits were needed to prevent the film from becoming bogged down by the drama of it all. The Gryffindors looking at the backsides of the Beauxatons girls. Blatant, but funny. Crass, but very true. Another GREAT GoF moment, one of the things that takes mere seconds to occur but which makes you want to hug Mike Newell. Snape and Karkaroff exchange a 'look' which clearly shows they're not friends. Cute moment between Hagrid and Maxime, made funnier by Hagrid being so distracted that he stabs poor Flitwick with a fork. Moody enters, somewhat ominously, but not too obviously. Crouch and Dumbledore introduce the goblet and the tournament. Some other reviews have said Roger Lloyd Pack is bad as Crouch, again I beg to differ. Crouch is a stiff character, there's not much you can do with him. But still he comes across well. We see Karkaroff alone with the goblet, not sure why. I suppose if you haven't read the book, he could be seen as the potential 'baddie' but because I've read GoF a zillion times, the thought never occured to me. THE DADA class. Wow. Brendan Gleeson is THE MAN. He has Moody truly down. Awesome. I love the way that the scene starts out, all light and fun with Seamus being told off for disposing of his gum wrongly. Even the spiders thing is laughable ... until Moody suggests making it throw itself out the window. You could've heard a pin drop in the cinema. Another great GoF film thing; the sudden change of mood is so dramatic, yet so convincing. We easily get the message that these curses are NO joke. But poor Neville. Looking into his eyes, you can see him picturing his parents in place of the spider. My heart bled for him. Matthew Lewis has really grown into the role, he is perfect. Moody comes across as more cruel than forward, in some ways, and murdering the spider right in front of Hermione's face, when she was already obviously upset, was a bit too much. Couldn't help feeling Ron loved the class a bit too much, that made him seem like a bit of a jerk. We see Neville on the staircase and once again, you just want to reach out and hug the guy. The rain. Very effective, typical British weather. And let's face it girls, we're not about to complain about a wet Cedric The dropping of the names is all very well done and again we see Hermione (with a book!!). She's smug with the twins, which is very in-character, it's almost as if she's literally jumped from the pages of a HP novel. The twins are cute but nothing to write home about. In fact, I found their appearances more irksome than anything else. If they were funny, I might not have minded as much, but some of the stuff they did was mindless. Which yes okay maybe fits Fred and George but when you think of everything that was cut, you can't help but feel cheated, when you see some of the stuff that's left in. The announcing of the names is done very well. Credit to Gambon, his Dumbledore is growing on me. His reactions are very realistic, albeit a little heavy-handed. I loved the way Hermione was pushing Harry forward. Don't know why really, it was just funny, I guess. Again, I disagree with popular opinion; Snape is not set up to be 'evil'. By the end of the film, he actually comes off smelling of roses, in comparison to Barty! His insistance on Harry taking part almost seems like common sense, even if he does put it across sardonically. And Dumbledore agrees with him, so he's not all bad if the wise one thinks he's right. The tension between Ron and Harry could cut through ice. It's played out well by both Dan and Rupert and you end up feeling sorry for both, equally. I love the way we see the start of this tension in the hall, right when Harry's name is first called. Sirius' letter is done effectively. Rita is poisonously charming, though you can't help feeling she should've been cut. Her role is virtually pointless, as this H/Hr/K triangle isn't even dwelled upon much. And her beetle thing is omitted. So yeah, I would've cut her completely along with the QWC, cruel, I know. This makes me think perhaps they used her so people knew who she was for OotP. But again, the point of that would be lost, because she's not really that bothersome in the film and she doesn't cause much trouble. There's a rather funny moment where Harry's eyes are level with her ... chest. Don't know if that was deliberate, but it was funny. Sirius in the fire. Brilliant effects and the scene is played out well. Again, we see the bitterness between Harry and Ron. The whole Parvati-told-Seamus-to-tell-Ron-that-Hagrid-is-looking-for-you was really funny and the realisation that it was Ron all along, trying to get a message to Harry, was unbelievably sweet. Even when he's angry, he still loves Harry. This film really shows them as best friends. Again the Hagrid/Maxime stuff is cute, if a little sappy. The dragons genuinely look scary though, sorry Hagrid, I don't see how they're 'misunderstood'. The Potter stinks badges are cool but if you blink, you'll miss them. Cedric is really endearing and Harry gets mad at Ron for not telling him about the dragons, when it turns out Ron did in fact tell Harry about the dragons, albeit inadvertently. Then we get the whole ferret scene. Moody is once again amazing, as is McGonagall. The whole hug scene is done well and it does come off as being a worried thing, not an OMG I LOVE YOU thing. Hermione is visibly anxious, to the point where she looks like she might wet herself. This whole scene pans out really well and Krum tells Rita to back off. Similarly, there's a cute scene with him where he's 'excerising' and loads of girls are following him, but he only has eyes for Hermione, who is studying!! (again, a book!!). The dragons are selected and Filch sets off a canon. It's amazing how much he, and other teachers, like Snape, are seen in the film even though they do very little. They're always looming in the background of most shots, which is good because it reminds you of their continuing prescence. The first task was my least favourite, probably because it involved flying and I dislike Quidditch. The beginning was quite funny, when it looked like Harry was just going to walk and fetch the egg. The twins had some not-so-funny lines and Hermione nagged a bit. The chase was ok, but like I said, I don't really like brooms so it was all a bit blase for me. The common room -- again, unfunny lines from the twins. Ron and Harry making up is incredibly sweet, you just want to grab the both of them into a giant bear hug. The next few scenes pass quickly, my only quibble being that Ginny saying 'ghastly' just doesn't sound right knowing what a madam she turns into in the next book. Far too eloquent. The dance class was funny, but again, silly additions from the twins, who didn't seem to be taking part for some odd reason. Neville is once again, a sweetheart. The Ball looms and the boys are without dates. The Snape-hitting-them-across-the-back-of-the-head scene was funny still after having seen it multiple times online and Rupert really shines as Ron, even if he is being a huge jerk. You get a real sense of boys-will-be-boys banter between Harry and Ron that really makes their friendship appear more obvious than in the other films. Emma is also really good at Hermione, giving Ron what for when it's due. The Harry/Cho scene is sweet, Katie really is amazing as Cho, and Harry looks so heartbroken as he gazes into the fire afterward. The Ron/Fleur thing is comedic and Hermione's reaction is brilliant when she thinks Fleur said yes. You can so tell that Ron going with Fleur, would shatter her world. Hermione's appearance is anti-climatic for a number of reasons. Emma Watson is beautiful, we've already seen her at premieres looking this way. Plus the hair doesn't really change, whereas in the book it becomes straight. And, I'm sorry, but the dress is horrific, and I don't just mean the colour (which, by the way, clashes horribly with Krum's red!). Chiffon or not, the frills are awful. I've seen the kiddies versions in M&S and it's now obvious they made it this way so they could sell off cheap replicas to little kids. Always thinking of the profits, eh? LOL. The dancing is done well and I liked the mix of formal and informal. You really feel sorry for the Patil girls, who both deserve so much better. The argument at the end of the Ball is played really well by both Rupert and Emma. Unfotunately, the night ends in tears and you really feel for Hermione as she sits on the stairs, balling her eyes out. Another moment where you want to reach out and hug a character. Just goes to show, this film does that really well, you really care about the characters and what's happening to them. Hermione does more nagging and Cedric helps out Harry. The prefect bathroom scene is done really well. Myrtle is very keen on Harry and actually gets in the bath with him! She makes jokes about Cedric's bubbles nearly all fading away and Harry visibly tries to cling onto the little privacy he has. The mersong is beautiful, even a little creepy. Once again we see more sweet Neville scenes. The second task is my absolute favourite. The look of the whole sequence is so well done. Everything is eery, not just the creatures, but the atmosphere too. The dummies do look very fake from afar (the hands particularly) but close-up they are good. Otherwise the effects, especially for the 'transformations' of the champions, are brilliant. Fleur thanking Harry and Ron is classic, especially Ron's reaction 'merci'. hehe. And once again we see Hermione being motherly, though admittedly it would've been nice to see her react to Fleur. Crouch talks to Harry about losing family. Again, I disagree with people, to me this is very fitting and only adds to the suspicion. The next part, Barty's dead body, is totally unexpected. Especially since the scene is happy. Another great contrasting GoF moment. We see Fudge and Dumbledore fight, an indication to the 'parting of the ways' which I hope will be more focused on in OotP. The pensieve scenes follow, which are acted out very well and conveniently give just enough information for the audience to be informed. A part of me expected Karkaroff to out Lucius Malfoy, but he didn't. Dumbledore vouches for Snape, which to me would seem to settle any doubts about him. Snape accuses Harry of thieving items. I loved this scene, predictably, because it shows that though Snape may have changed, he's still not the type of guy you can cuddle up to or anything. The maze was cool, I felt myself ducking at times. I can understand the lack of creatures; it could have easily made the film CGI overkill. And I do not think the task was easy; I mean, the plants practically ate Fleur and tried to do the same to Cedric! Hardly easy! The Krum stuff was done well, especially the eyes, nice touch. Harry's hesistation to save Cedric shows the dangerous potential in Harry to do evil. Luckily, he makes the right choice, but still it's unnerving to realise what Harry is capable of doing. From this point on, I didn't really get a clear vision of the film, because I was in tears, as Cedric's body hit the ground. I thought I might get a tad upset, but I was honestly overwhelmed. Oddly enough, it's not even because Cedric is set up well; because he isn't really. But nevertheless, it's heartbreaking. Seriously, these weren't just run-of-the-mill tears. I was sobbing, hence the blurry vision. Sobbed through the whole next series of scenes. Voldemort didn't look as scary as I'd imagined BUT he sure acted frightening so that sort of made up for it. Dan Radcliffe outdoes himself in these scenes. He really IS Harry. I couldn't help swearing when Voldemort cast crucio, you really really hate him for what he's doing. The ghosts were sad, although short-lived. The following scene is the saddest. Everyone's happy, but you're crying .. and then Fleur screams ... Amos cries .... Cho cries ... Harry gets into hysterics ... and all the while I'm sobbing my heart out, wanting to pull them ALL into a group hug. Everyone is thoroughly convincing. Moody drags Harry away and starts talking, psychotically, and a part of you wonders why Harry's sat there listening to him. (RUN BOY!!!!) Obviously, he's still in shock after what's happened but it soon becomes clear Moody is deranged and isn't who he pretends to be. The teachers arrive, the transformation occurs and Moody is forced to tell the truth. Snape seems to wait for Dumbledore's nod before doing anything ... which could point to HBP in some way. The bit between him and Barty isn't suspect at all, contrary to what some people have said, and he forces the wand into Barty's cheek; the hatred is very obvious. You're left in no doubt that Snape, at this given time, is clearly only following orders from Dumbledore. The speech from Dumbledore was moving. I love Gambon for his interpretation; he makes Dumbledore human, easier to connect and relate to rather than some godly being. And the way all the kids and even the staff, are placed together, showed solidarity. Bear in mind I was still sobbing at this point lol and couldn't really see much. The goodbyes don't seem happy really. Well not too happy any way. Put it this way, they don't contradict the mood of the previous bit and Hermione's ending line, "Everything's going to change now, isn't it?" sums it all up. Thankfully they edited out the more cheery half of this scene, which we saw in bts clips, which probably goes to show they realised how potentially problematic (LOL) showing too much cheeriness could be. In terms of acting, the three leads all improved, though I do still think Rupert and Emma are slightly ahead of Dan. But, credit where credits due, they all had their shinning moments. All I can say is roll on the BAFTA 2006 nominations! Somehow, I see LOADS coming GoF's way! Last edited by EmmaRiddle; 11-22-2005 at 02:59 PM.